As performance brands go, the Cupra brand, which has been around for 20 years is one that has proved itself time and time again. SEAT have again stepped up to the plate with the facelift model of the Ibiza Cupra and have given us a serious contender for being the top hot hatch. It is definitely capable of putting it up to its stiffest competition in the Peugeot 208 GTi, Opel Corsa OPC and the Ford Fiesta ST. 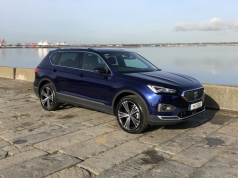 Given the retail price on all new vehicles and the fact that most people are only starting to find their feet again financially, the luxury of having a weekend car or second car which is a performance model is simply not there. 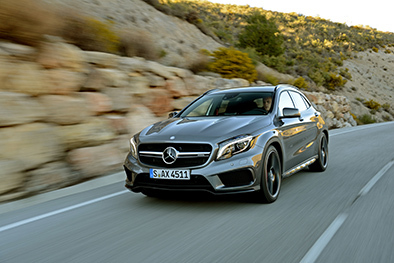 What we are now being offered in the hot hatch segment are cars that are suitable to drive as your everyday car but also pack that punch that when you want and need the power it is there at the touch of a button. 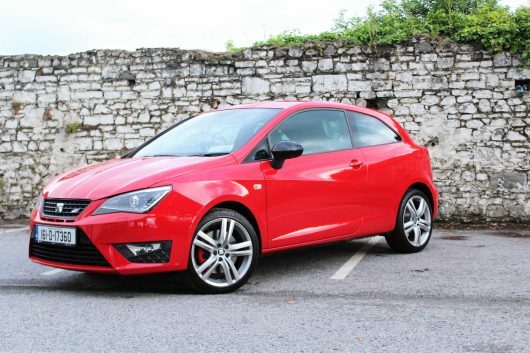 This is what SEAT have delivered with the newest facelift of the SEAT Ibiza Cupra Sports Coupe. 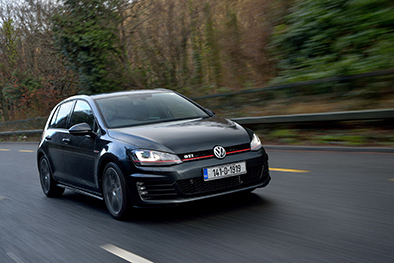 Gone is the old 1.4 turbo charged petrol engine coupled with a DSG transmission which has now been replaced by a powerful 1.8 TSI engine paired with a 6 speed manual gearbox. Styling on the exterior of the Ibiza Cupra has been updated to keep in it check with the competition. 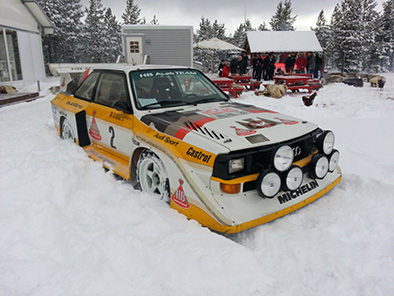 One of the nice touches is the centred trapezoidal exhaust tail pipe located in the rear body coloured bumper. 17 inch Barcino alloy wheels connect to the Cupra specific suspension helping the Ibiza Cupra nestle down as you take to the road. 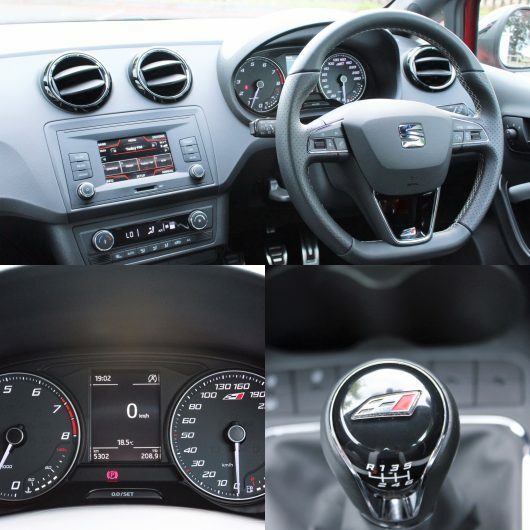 Sit inside the new Ibiza Cupra and you will initially be greeted by the large touchscreen which allows access to all of the vehicles infotainment, connectivity and vehicle information. Syncing your smartphone is also made easier with the inclusion of Apply CarPlay and MirrorLink. It is what is positioned below this screen that most people will be interested in. This is the “Sports” button which allows the driver to alternate between normal and sport driving modes. At the press of the button you will notice a change to the vehicles suspension, greater weight to the steering and the exhaust becomes more audible. Space in the front two seats is perfectly acceptable while the rear seat space is slightly restrictive for larger passengers. Boot space stands at 292 litres which is close enough to its rivals give or take 10 litres or so. 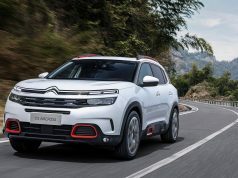 The technology continues with the inclusion of Bi-Xenon headlights with LED daytime running lights, climate control, cruise control and automatic lights and wipers as standard. 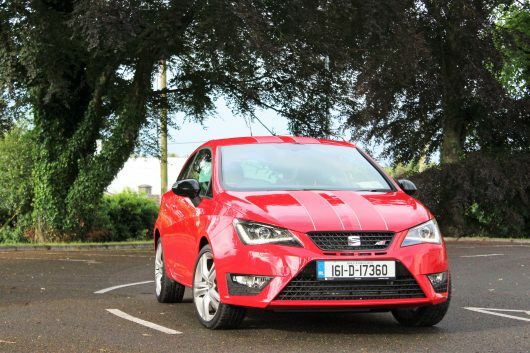 SEAT have also included the XDS electronic differential lock which rather than utilising a typical mechanical differential as some of the competitors do this system which provides braking to the front wheels when cornering to ensure maximum traction. 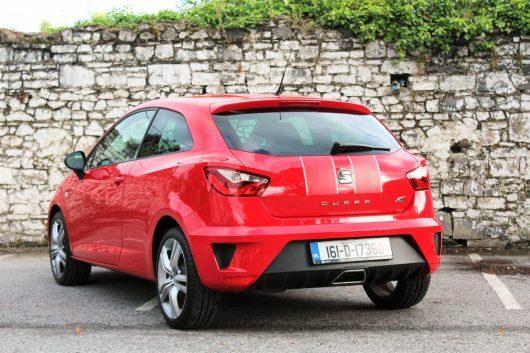 Taking to the road in the newest SEAT Ibiza Cupra you will notice that you get plenty of value for money. It has the performance that is available on demand and also the comfort that it doesn’t become exhausting over longer journeys. The steering offers ample feedback as you take on winding country roads and the suspension setup which adjusts when Sport mode is selected deals perfectly with most bumps put in its path albeit it is a bit harsh over bumps at lower speeds. The power distribution within the Ibiza Cupra is excellently balanced. 320 Nm of torque is delivered between 1,450 and 4,200 rpm so there is never any need to chase down the top end of the redline, well, that is of course unless you want to push the Ibiza Cupra that little bit further as the rasp of the exhaust rings through the cabin. The one thing that I am still struggling to get my head around is the pricing. 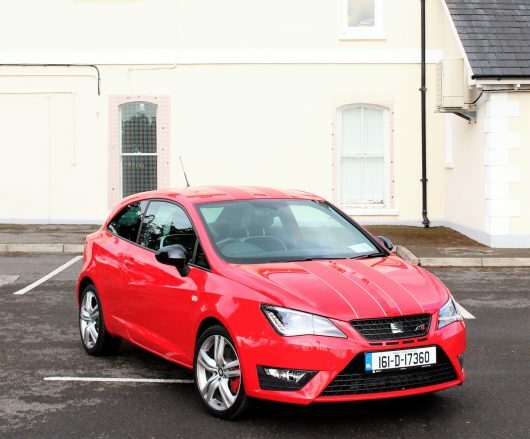 The SEAT Ibiza Cupra is available for a lot less than its competition and in light of this it should be definitely considered if you are in the market for a sporty, powerful hot hatch. 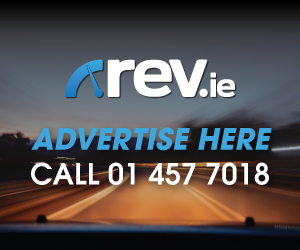 Previous articleSay Hello to The Irish Drift Championship!